To set the theme. 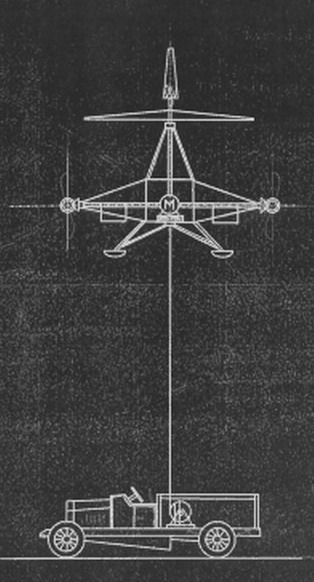 We are in Austro-hungary where on 28th of april 1916 Stephan Petroczy von Petrocz made a proposal to the LFT (Luftfahrtruppe) for a mechanized observation machine (a Schraubenfesselflieger) which could be a replacement for the combersome observation balloons. He even presented a rough sketch how the machine should look like. The LFT granted a budget to develop this machine. After an intermezzo that I do not tell here. The mathematical genius Theodore von Karman and the brilliant engineer Wilhelm Zurovec got the order to develop two SFF machines, driven by different engines. One by an electromotor the other by a benzine motor. The model was completely designed by Zurovec with the first two challenges in mind. In the picture you see the unique model of a Schraubenfesselflieger (abbreviated as SFF). This word is an almost unique word in Austro-hungary, which meant that machine was captive to the ground with lines. In english it is mostly translated as a captive helicopter. Do not think that in those times a free flying and steerable helicopter was envisaged. The machine was used for stability tests, which ultimately resulted in the most stable construction where at 3 points a line to the ground was fastened. The lines were kept in a trapezium form, which can be seen in a drawing on the Austrian patent 87698. Schraubenfesselflieger. The second challenge (the lifting power) had to do with the efficiency of the propellors (forget all you know now perhaps about rotor-blades, they did not exist and were in the engineeringparadigma in those times) and the placement on the machine. The development of the propellors was the joint effort of von Karman and Oskar von Asboth who was primary a specialist in propellor-design. In the model the placement of a propellor at each end of the fuselage was ultimately the best design. As I already mentioned, the model was all-alone designed by Wilhelm Zurovec. Of course he interacted with von Karman and to a lesser degree von Asboth but the engineering solutions on the model were all his. Lastly there are the spelling of the names of the protagonists. There is little uniformity, because there are German oriented names for the Austro-hungarian era, but also Tchech and Hungarian versions. Is is astounding that governments of today are claiming the effort and inventions that were made in theAustro-hungarian period. Theodor von Karman becomes in Hungarian Karman Todor (the first name is in Hungarian after the family name).